The former leader of the shadowy Ennilux Corporation, a criminal enterprise forged by Inhumans who had splintered off from Attilan many centuries ago. Hiding among mankind, The Ennilux Corporation manipulated aspects of human history, contributing to such matters as the industrial revolution and advances in rocket science. The long-time leader of Ennilux was an aged Inhuman who was known only as ‘The Capo.’ He controlled the organization for centuries (possibly from its very inception). The Capo maintained his longevity by having his consciousness transferred into new Inhuman bodies whenever the previous body had grown too old. Transferring consciousness in this fashion required a new host body with just the right power levels and genetic composition. The Capo has extended great expense in the location and abduction of powerful Inhuman bodies in which to supplant his consciousness and prolong his life. Taking over these bodies effectively extinguishes the consciousness of the host body. The Capo’s most recent form was in the body of a red-scaled Inhuman with bat-like wings. He had been residing in this body for a long while and it had been long past time for him to locate a transfer into a new form. The advent of the Terrigen Bomb and the creation of various NuHumans afforded The Capo the opportunity to find a new body well suited to his needs. He hired the Inhuman mercenary, Reader, to track down and bring him an ideal candidate. Searching the globe, Reader eventually came across the NuHuman named Iso. Iso had grown up in real Mainland China and Reader arrived in time to help save her from a military force that was sweeping the countryside in search of super-powered beings created by the Terrigen Cloud. Reader eventually brought Iso to Italy and handed her over to The capo and his Ennilux Corporation. It hadn’t quite dawned on Reader what exactly Ennilux had in store for Iso. He ultimately realized that she was meant to offer The Capo his new body, a process that would essentially destroy Iso’s sentience. Experiencing a change of heart, Reader again rescued Iso, taking her back by force just before the consciousness-transplant was to occur. Betrayed and enraged, The Capo and his forces chased Reader and Iso, a pursuit that led them all the way to New Attilan where a battle ensued between the Ennilux soldiers and the Inhumans of New Attilan. Black Bolt put an end to this conflict by using his molecular disruption powers to blow up the Capo’s command zeplin. The NuHuman named Lineage sought out the wreckage of the helicopter and salvaged The Capo’s decapitated head, preserving it in a jar of strange liquid. Lineage later drank this liquid and consumed the head, apparently killing The Capo and absorbing all of the aged Inhuman’s stored knowledge and secrets. When Karnak broke free from the ‘prison’ of Lineage’s powers, The Capo was apparently also freed. It was not entirely clear if this meant that The Capo, like Karnak, was reincarnated by this event. More recently, The Ennilux Corporation held a shareholders meeting at the main hall of The Quite Room. There the new chief financial officer of Ennilux, Marishi Spin, expounded on The Capo’s demise. Whether or not The Capo is indeed dead or if he is merely assumed dead remains to be seen. An Inhuman with blue skin and a set of large, curled and spiked horns protruding from his head. Carthus was heavily involved with the Genetic Council, acting as its chancellor for two separate tenures. He was chancellor during the time that Attilan relocated from it’s initial location in Iceland to the secret mountain top in the Himalayas. He was later replaced as chancellor by Kiting, but won the seat back after the former chancellor, Arcadius, fled Attilan. Carthus maintained the position through the Silent War event; whereupon Maximus had him replaced by Carthus’ former protégé, Avia. During his time as Chancellor of the Genetic Council, Carthus advocated for an isolationist agenda and did not agree with Black Bolt’s decision to maintain diplomatic relations with the human nations. Carthus was ardent in his beliefs regarding the philosophy of eugenics and the attempts to guide the effects of Terrigenesis via selective breeding and arranged marriages. Carthus maintained a spiritual outlook on his attitudes toward eugenics, feeling that the Inhumans faced a divine right and duty to be the superior race on Earth. When Terrigenesis caused the young Inhuman, Dewoz, to seemingly transform into an Alpha Primitive, Carthus saw it as an atrocity and sign that the culture of Attilan had lost its way. He used the event as leverage in his advocation for the re-institutionalization of arranged marriages and mating practices. Carthus treated young Dewoz quite poorly. Although he claimed that he would look after the youth and attend to his best interests, Carthus merely deposited Dewoz in the caverns of the Alpha Primitives and left him there to fend for himself. Whereas Carthus objected to the emissary program to send several young Inhumans to America as a type of student exchange program, he did agree to participate in selecting which young Inhumans would be involved. Carthus demonstrated a special interest in selecting Jolen as one of these emissaries. He could see that Jolen maintained a similar animosity toward the humans and cultivated this further, insinuating to the youth that the program in and of itself was actually a first component of a long term strategy to wage war on the humans. This ultimately led to Jolen killing several humans during his time in America (murders that neither Jolen nor Carthus have yet been held accountable for). While Black Bolt put up with Carthus’ scheming ways, his brother, Maximus, proved far less lenient. Shortly after Maximus became king at the conclusion of the Silent War event, Maximus had Carthus removed from the council and his chair as chancellor was offered to Avia. Carthus has not been seen from again and his current whereabouts remain unknown. An artificial Inhuman who underwent Terrigenesis by accident. Professor Cartwright was a scientist who worked for SHIELD in conjunction with the Office of National Emergency. Gorgon had been captured by the Fantastic Four during the Silent War event and the FF handed him over to agents form the Office of National Emergency (or O.N.E.). Professor Cartwright had been working there, studying the cache of Terrigin Crystals that had previously been stolen by Quicksilver. Interested in the effects of secondary Terrigenesis in Inhumans, Cartwright exposed Gorgon to a concentrated form of the mists and the subsequent Terrigenesis caused Gorgon to mutate into a larger, more feral form. With newly enhanced strength, Gorgon broke free of his restraints and shattered the protective chamber where he was exposed to the mists. This led to Cartwright himself being exposed and he was subjected to Terrigenesis. Normally, exposure to Terrigen does not cause regular humans to go through Terrigenjesis. The highly concentrated version of the mists, however, had a mutagenic effect on the professor, causing him to gain tremendous strength and muscle mass and his body increased two-fold in size. Unfortunately, this artificial version of Terrigenesis was fatal and Cartwright’s body began to break down and slowly degenerate shortly after his transformation. Although the process that transformed him was fatal, Cartwright conceded to SHIELD commander, Maria Hill’s orders to perform this artificial Terrigenesis on a group of Marines who would act as an assault force against Attilan. Toward the end, Cartwright came to regret his actions and he ultimately returned the stolen crystals to Gorgon following his escape. Cartwright died shortly thereafter. An Inhuman with a centaur-based form (the head and torso of a human and the body of a horse). There have been a number of centaur-based Inhumans who have acted as guardsmen in the history of Attilan and it appears as though transforming into a centaur-like being is one of the few types of Terrigenic transformations that is effected by family genetic predispositions. Centurus is the brother of fellow centaur, Avark and the cousin of Staler and Chiron. Centaurus had been assigned to stand guard over Maximus. He alerted Black Bolt when Maximus appeared to fall into a mad fit, sensing the imminent arrival of Blaster, the tyrant of the negative zone. It was Centaurus’ sole appearance and his current whereabouts remain unknown. A winged Inhuman who lived on Attilan centuries ago. Cherios, like many of the other winged Inhumans of the day, saw himself as being of greater status compared to those who were wingless and could not fly. He aligned himself with Kylus in demanding of King Nestor that the private city of Aerie be built, exclusively for the winged Inhumans. Kylus was ultimately given his way, yet the creation of Aerie, held aloft by anti-gravity projectors, only acted to compound tensions between the winged and non-winged Inhumans. Kylus decreed that Aerie should secede from Attilan. Cherios was the sole voice of opposition and it caused Kylus to become suspicious of him. Kylus, and the majority of the winged Inhumans, had feathered, bird-like wings… whereas Cherios and the minority of winged Inhumans had leathery, bat-like wings. Kylus’ fearful bigotry deepened and he declared that all bat-winged Inhumans were not ‘pure’ and should be purged from Aerie. Cherios and his fellow bat-winged Inhumans were all slaughtered. It was the final straw and King Nestor granted Aerie its secession, severing the tether that connected the floating city to Attilan and leaving the winged Inhumans to their fate. Aerie struggled greatly on its own, many of its citizens starved and succumbed to the elements. As time past Aerie was eventually able to attain self-sufficiency and ultimately thrive. Kylus died and new rulers were elected. Through an odd twist of genetic fate, the new generation of Aeirens were born with wings and did not require Terrigenesis to attain them. As Aerian culture moved forward, they came to feel ashamed over their society’s bloody origins and the purging of their bat-winged kin. An Inhuman who served as a sergeant in the Royal Guard. Like his brother, Stalior, and their cousin, Arvak, Chiron is a centaur-like Inhuman, with the body of a horse and the head and torso of a human. Chiron and the other centaur-based Inhumans represent an example of how Terrigenesis may be impacted by epigenetics. Exposure to the Terrigen Mists frequently brings about extremely random results. Close monitoring of bloodlines and arranged mating practices, however, has (at times) proven effective in predicting and (to an extent) controlling the results of Terrigenesis. Chiron’s family linage has produced numerous centaur-based Inhumans, most of whom have served as high-ranking figures in the Royal Guard. Although this is one of only a few instances where practiced eugenics has proven effective in shaping the effects of Terrigenesis. Chiron’s name is a play on the mythical character from ancient Greece, Kheiron, who acted as a teacher and care provider for young Achilles. Chiron has only made a few appearances and his current whereabouts remain unknown. An Inhuman with purple skin and red hair with a set of feather-like antenna. She possesses the ability to fire plasma bolts from her hands. Following the establishment of New Attilan in the Hudson Bay, Chynae was promoted to the Royal Guard. She battled a group of renegade AIM scientists who were trying to pilfer technology from the ruins of old Attilan. An errant shot almost struck Chynae but was deflected at the last moment by Captain America’s shield. Chynae continues to serve as a member of the new Royal Guard. An Inhuman from a possible future timeline depicted in the pages Guardians of The Galaxy Vol. 1 (Earth 691). In this future timeline, Loki had conquered all of Attilan and utilized its population to create gladiators to fight for his amusement. Composite was one such gladiator. Created via a specialized breeding and cloning program, Composite possessed all of the powers of the original Royal Family. He had Medusa’s prehensile hair, Gorgon’s seismic hoof-like feet, Karnak’s capacity to detect weakness and Black Bolt’s molecular disruption beam and sonic scream (the last of which was kept in check by a muzzle that prevented Composite from using this destructive weapon against his master). Loki ultimately used his army of Inhumans in an attempt to invade and conquer Asgard and it was at this point that the Guardians of The Galaxy intervened. Loki’s army was defeated and he, Composite and the other Inhuman gladiators were imprisoned in the inescapable Black Canyon between Niflheim and Muspelhe. A winged Inhuman originating from the floating city of Aerie (a sovereign city-state that had seceded from Attilan centuries ago). Condor was ambitious and bored by the peaceful and simple surroundings of Aerie. He flew down to the human world to try his hand at being a super criminal. This brought his into conflict with the superhero known as Nova (Richard Rider). Condor was ultimately defeated and incarcerated in a human jail for super-powered inmates. Some time later, The Ani-Men broke Condor out of prison and used a special mutagenic ray to transform him into an anthropomorphic half-man/half-bird creature. Once more Condor took on Nova and, following a tremendous battle, Condor was once again defeated. Presumedly, Condor remains incarcerated; it is unknown if he has maintained his mutated form or his he has reverted to his original form. A super villain and one-time Dark Avenger who formerly went by the moniker, ‘Toxie Doxie.’ Dr. Covington has maintained a longstanding obsession with bodily augmentation and the gaining of super human powers. Over the course of her villainous career, Dr. Covington has utilized numerous forms of mutagenic substances and elixirs in her efforts to gain preternatural capabilities. During the Inhumanity Event when the Terrigen Cloud was causing numerous NuHumans to transform, Covington’s agents stole a set of pre-hatched Terrigenic Cocoons. Experimenting on these cocoons, Covington was able to concocted a formula that she injected into herself, bestowing her with the same Inhuman abilities of one of her subjects (a NuHuman named Schlickeisen). This made Covington something of an ersatz Inhuman and, along with her previous abilities, Covington now had the capacity to be invisible to any sort of electronic surveillance. Covington’s lab was invaded by The Avengers with the help of Spider-Girl. Covington and her goons were ultimately defeated. Her current whereabout remains undisclosed, but it is likely that she is incarcerated in some form of superhuman detention facility. It is unknown whether or not she has maintained her newfound Inhuman powers. Prince Namor The Sub-Mariner ultimately defeated Dr. Hydro, but there appeared to be no cure for the Hydro-Men. No longer able to survive on the surface world, Namor offered them a home in the sunken kingdom of Atlantis. Croft was one the first of Dr. Hydro victims. He had bee a professor of genealogy and the others elected him as their leader and tasked him to venture back into the human world in hopes of finding a means of transforming them back into regular humans. Croft sought out Reed Richards of The Fantastic Four. Richards identified that it had been Terrigen that had transformed Croft and the others. He contacted the Inhumans of Attilan and, with the aid of the Inhuman scientists, Nadar and Budan, was eventually able to concoct a chemical compound that could reverse the mutagenic effects of Terrigen. Croft volunteered to be the first exposed to this new compound and it succeeded into transforming him back to his human form. The compound was then used to revert the rest of the Hydro-Men back into regular humans and they were each able to return to their former lives. An Inhuman who served on Maximus’ puppet-cabinet version of the Genetic Council (following Black Bolt’s stepping down in the wake of the Silent War event). Kronos advocated for a separations agenda and was highly concerned about the matter of security once it was revealed that Black Bolt had been replaced by a super skull and that any member of the Inhuman populace may also be Skrull sleeper agents. Cronos possesses slightly ape-like facial features and tentacles in place of arms. The nature of any supernatural abilities he may possess have thus far been unrevealed. Cronos’ role during the Secret Invasion story-line has been his sole appearance thus far and his current whereabout remains unknown. Crystalia Amaquelin. The daughter of Ambur and Quelin and younger sister to Queen Medusa. 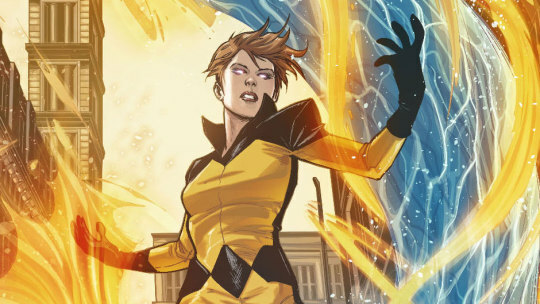 Crystalia (or ‘Crystal’ as she is more often called) was exposed to the Terrigen Mists during her late childhood. Terrigenesis had a minimal effect on her physical form and endowed her with vast powers. She gained the ability to exert temporary control of the four base elements of earth, wind, fire, and air. This enabled her to create controlled bursts of flame, powerful gusts of wind, send forward a directed torrent of rock and dirt, and manipulate water into spinning spouts. Although it took Crystal a great deal of training to better master these abilities, hers has proven to be one of the more impressive power-sets among the Inhumans, leading Crystal to become highly respected and popular among her people. Crystal’s aunt, Azur, married the former queen’s brother, Mander, and this afforded young Crystal placement among the royal precession. In as such she grew up in the opulent setting of the palace and enjoyed great privilege. Her status within the caste system of Old Attilan was further augmented when Terrigenesis endowed her highly impressive powers. And yet, this privilege and good fortune never appeared to go to her head and she remained kind, open and respectful toward others. Crystal was the youngest of the various children growing up in the palace and, being the youngest, Crystal often felt left out of the various games and activities that occupied her older sister and cousins. Often left on her own, Crystal ended up forming a powerful and lifelong bond with the prince’s watchdog, Lockjaw. Crystal’s early experiences of social solitude may have also contributed to her later life interests for adventure to desire to explore the world outside of the confines of Attilan. At one point, Crystal’s cousin, Maximus, abducted her and threatened her life as part of a ploy to elicit an angry reaction from his brother, Prince Black Bolt. Due to the potentially disastrous nature of Black Bolt’s powers, he needed to maintain absolute self control and Maximus was trying to break this control by putting young Crystal’s life in jeopardy (in Maximus’ bent thinking he believed that Black Bolt’s loosing control would prove that he was too unstable to rule and thus Maximus would be named the crown prince). Yet Black Bolt was able to maintain his stoic self control and he saved Crystal. Crystal had initially been quite frightened and intimidated by her cousin, Black Bolt. After this encounter, however, Crystal came to feel great devotion, respect and fondness for the prince. Years later, yet another of Maximus’ sinister schemes resulted in a successful coup were upon Crystal and the other member of the royal family were banished from Attilan. Crystal’s sister had gone missing and, under the influence of amnesia, had fallen in with the human criminal, The Wizard. Aided by the teleportation abilities of Lockjaw, Crystal and the others went in search of Medusa and it was during this time that Crystal first met young Johnny Storm (the Human Torch of The Fantastic Four). Both attractive teenagers possessing incredible powers, there was an instant connection between Crystal and Johnny. At first, Crystal assumed that Johnny was an Inhuman like herself. When she discovered that he was a human, however, it did not at all diminish her feelings for him. The other Inhumans tended to look at the regular humans as inferior and primitive, but Crystal held no such prejudices. She saw the humans as equals and was fascinated by them… a feeling that quickly blossomed into a long and torrid romance between Crystal and Johnny Storm. The Fantastic Four ultimately traveled back to Attilan and assisted Black Bolt in regaining the throne from his mad brother. In a desperate act of spite, Maximus activated an impenetrable negative zone force field that shielded off Attilan from the outside world. Crystal was trapped within the city while Johnny and the other members of the Fantastic Four were trapped outside. Heartbroken, Johnny vowed to do whatever it took to be reunited with Crystal. The negative zone force field was eventually deactivated and Crystal and Johnny were finally reunited. Crystal decided to return with Johnny to the human world and she joined the ranks of the Fantastic Four, taking over for Sue Storm during her maternity leave. Crystal proved to be a valued member of the FF and her quick thinking and elemental powers saved the day on many occasions. Sadly, Crystal and Johnny’s romance began to dwindle. They grew apart and Crystal eventually left Johnny, returning to Attilan. Some time later, Crystal came across the Mutant and one-time Avenger known as Quicksilver. Quicksilver had been injured in a battle with a sentinel and Crystal brought him back to Attilan to recuperate. During Quicksilver’s convalescence, he and Crystal fell in love with one another. Soon thereafter, Johnny Storm returned to Attilan in hopes of winning Crystal back and was heartbroken and angered to find that Crystal had moved on and was in a new relationship with Quicksilver. The animosity between Johnny and Quicksilver notwithstanding, Johnny was eventually able to work through his hurt feelings and maintain a close friendship with Crystal. Quicksilver proposed marriage to Crystal and she accepted the proposal. No Inhuman of Attilan had ever wed an outsider and their engagement caused quite a stir among the Inhuman peoples. With her royal bloodline and great powers, The Genetic Council very much wanted to say in whom she would marry… in the hopes the union would produce powerful new Inhumans. Yet King Black Bolt overruled the Council’s objections and gave Crystal and Quicksilver his blessing. The two were wed in a lavish ceremony in which Johnny Storm, The Fantastic Four, and The Avengers attended as guests. Following their marriage, Crystal and Quicksilver resided in Attilan. At the time, Attilan maintained a cloned slave caste who provided the various manual labor needed to keep the city-state functioning. Crystal’s good nature and her strong sense of justice, coupled with her experience in the world outside of Attilan ultimately led her to realize the great immorality inherent in slavery. She argued for the abolishment of slavery on Attilan; furthermore she was able to ascertain how Maximus had used the collective feelings of guilt and racism the citizens felt toward these cloned slaves as a psychic fuel power his giant android, Omega The Ultimate Alpha. Omega was defeated and Maximus’ plot foiled; and soon thereafter, King Black Bolt issued a decree abolishing slavery on Attilan and freeing the clones. Some time later, Crystal became pregnant with her and Quicksilver’s child. It was at this time that many of the citizens of Old Attilan had started to grow ill from the heightening levels of pollution in the earth’s atmosphere. Generations of living in isolation had left The Inhumans of Attilan highly susceptible to environmental toxins. Attilan’s location in the remote mountain range of The Himalayas had thus far shielded the Inhumans from these toxins, yet the gradual breakdown of the earth’s ozone layer and mounting levels of environmental pollutants had finally taken its toll on the populace. In the later stages of her pregnancy, Crystal was especially sensitive to this sickness and she fell gravely ill. Quicksilver rushed to elicit the aid of The Fantastic Four. Reed Richards and Black Bolt devised an intrepid plan and all of Attilan was ultimately relocated to the oxygen-rich Blue Area of The Moon. The plan succeeded and Crystal was cured of her ailment. She gave birth to a healthy baby, a daughter she named ‘Luna’ after Attilan’s new home on the moon. Luna grew up on Attilan and, for the most part enjoyed a very happy childhood. The Inhuman Marilla, who had once acted as Crystal’s governess took on the role of nanny for Luna. Being the daughter of Quicksilver and granddaughter of Magneto, however, would prove to be a matter that would put young Luna’s life in great peril. The evil Mutants, Fabian Cortez and Exodus, former acolytes of Magneto, abducted Luna. At the time, Magneto was presumed dead and Exodus hoped to utilize Luna as a means of consolidating power among Mutant dissidents. Yet, when he obtained Luna, Exodus realized that the toddler did not possess the mutant gene. The fact that the blood relative of Magneto was a non-mutant, a ‘flatscan’ incensed Exodus… he viewed Luna as an abomination and he attempted to kill her. Fortunately, Exodus was defeated by Crystal with the aid of the Avengers and X-Men. Luna was saved. All of this eventually took a great tole on Crystal and Quicksilver’s relationship. Quicksilver had always been an irascible and poor tempered sort and the alienation he felt as an outsider living on Attilan only acted to further intensify these qualities. Crystal and Quicksilver grew apart; the two eventually separated and were later formally divorced. During this time, Crystal fell in with The Avengers and served for a short while among Earth’s Mightiest Heroes. As a member of The Avengers, Crystal engaged in a brief affair with her fellow Avenger, Dane Whitman (The Black Knight). Toward the end of Crystal’s tenure with The Avengers, Iron man’s mind was taken over by Kang The Conquerer. This mind-controlled Iron Man killed Luna’s nanny, Marilla. Kang was eventually defeated, but it was the last straw for Crystal and she left The Avengers, returning to Attilan. Some time later, the events of M-Day resulted in 90 per cent of the Mutant population losing their special mutant abilities. Crystal’s ex-husband, Quicksilver, was among those Mutants who lost his powers. Despondent over the loss of his powers (and feelings partially responsible for the occurrence of M-Day in and of itself), Quicksilver attempted to take his own life, leaping from a building. Crystal discovered what had become of Quicksilver and found him critically injured. She brought him back to Attilan, where the Inhuman healer, Kalikya, was eventually able to successfully treat his grave injuries. Now healed, Quicksilvered petitioned King Black Bolt to allow him to go through Terrigenesis so to possibly reattain his special gifts. The process was too dangerous and unpredictable and Black Bolt refused Quicksilver’s request. Desperate and forlorn, Quicksilver decided to plunder a large cache of the Terrigen Crystals; he absconded from Attilan with these crystals, taking his daughter, Luna, with him. Hidden away, Quicksilver exposed both himself and his daughter to a concentrated form of the Terrigen Mists. Quicksilver obtained the temporary ability to travel short distances through time; whereas Luna gained the power to read (and, at times, manipulate) the emotions of others. Crystal, Black Bolt, and the others were ultimately able to track Quicksilver down, yet by then the cache of Terrigen Crystals had fallen into the hands of the governmental agency, SHIELD. Crystal was reunited with her daughter and Quicksilver was banished from Attilan forever under the penalty of death. The Inhumans’ attempts to re-obtain the Terrigen Crystals from the US Government eventually led to the ‘Silent War’ event, culminating in SHIELD director, Maria Hill’s decision to detonate an atomic bomb on the moon that cost countless Inhumans their lives. In the wake of the Secret Invasion Event, all of Attilan found itself embroiled in the intergalactic war between The Kree and Shi’Ar Empires (the War of Kings/Realm of Kings Event(s)). The Shi’Ar were ultimately defeated and The Inhumans became the rulers of the victorious Kree Empire. Black Bolt apparently perished in the act of defeating The Shi’Ar and Crystal’s sister, Medusa, was named the new Queen of The Inhumans as well as ruler of The Kree. As part of an effort to maintain peace within The Kree Empire, Medusa gave Crystal’s hand in marriage to the former Kree leader, Ronan The Accuser. Crystal was all but inconsonant. She respected Ronan as a warrior, but felt no fondness for him; and she was irate that her own sister would use her as a bargaining chip to consolidate power over the Kree. In the end, Crystal conceded to do what was in the best interests of her people and she agreed to marry Ronan. What began as a ceremonial and strictly political union between Crystal and Ronan slowly blossomed into a true romance. Ronan was dedicated to his bride and Crystal’s feelings toward him mellowed, ultimately turning to love. Sadly, their marriage did not last long. Black Bolt returned and retook the throne. As a means of separating the Inhumans from The Kree and relinquishing sovereignty over the empire, Black Bolt had Crystal marriage to Ronan annulled. Both were heartbroken, but Crystal once again bowed to what was determined to be in the best interests of her fellow Inhumans. Crystal returned to earth with the rest of Attilan and enjoyed a short respite with peace. She enrolled her daughter, Luna, into school at the Future Foundation. Later, at the behest of her daughter, Crystal made amends with her estranged ex-husband, Quicksilver. Crystal played only a minor role in the massive upheaval that occurred during the Infinity and Inhumanity Events. She did not appear to be especially involved in Inhuman affairs during this time and what exactly she had been up to in the time leading up to the Secret Wars event has thus far remained undisclosed. Following The Secret Wars Event, Crystal was assigned by her sister to command the Royal Inhuman Vessel (or RIV), a large, mobil fortress meant to attend to Inhuman issues all over the globe. Initially, Crystal used the RIV to assist Nur in the locating of many of the children of Attilan who had gone missing during the Infinity Event and the evacuation of old Attilan. Following this, Crystal led the RIV on a global ambassadorial mission to offer aid to the various NuHumans created by the Terrigen Cloud. An early port of call was Sydney, Australia, where Crystal acted to break up a human supremacy riot and saving a new Inhuman named Panacea. Following this, Crystal met with delegates from the United, Nations. Crystal had a difficult task convincing the United Nations to allow The RIV to circumnavigate the globe and breach international airspace so to address Inhuman affairs. To help elicit the U.N.’s approval, Crystal entered into a secret plot with the Mutant and former super-criminal known as Frenzy. Frenzy attacked the delegates aboard the RIV and Crystal defeated her. The demonstration proved more than enough to coerce the delegates into seeing the need and utility of Crystal’s mission and The U.N. offered it’s blessing. Later, Crystal revealed the conspiracy to her comrades and released Frenzy. Crystal’s duplicitous charade with Frenzy is demonstrative of much more free spirited, independent, and sometimes reckless attitude on her part. It is likely that Crystal has grown tired of being so often used a type of game piece by her sister; a sense of resentment has emerged in her and it is possible that she continues to be angry and heartbroken over the forced separation between her and Ronan. Crystal is willing the play the role of Princess and do her part to help her people, but she does not appear especially enthusiastic over her duties and is going go about achieving the goals in her own way. Following Australia, Crystal next brought The RIV to the Southeast nation of Sin-Cong. While there, Crystal and her team had to match wits with the nefarious Commissar, a dictator who had commanded the murder of all citizens who had undergone Terrigenesis following exposure to the Terrigen Cloud. Crystal and the others were ultimately able to defeat the Commissar and facilitate a regime change under the auspicious that New Attilan would provide the new ruling government of Sin-Cong with technological resources. This was another example of Crystal’s somewhat impulsive approach to her duties. She did not have authorization to make such a negotiation with Sin-Cong and both Queen Medusa as well as The Inhumans’ Shield liaison, Daisy Johnson, were bemused that Crystal should go over her heads in this fashion. Crystall did not appear to especially care and it doesn’t seem as though her more maverick attitude will be dissipating any time soon. An aquatic Inhuman with brown skin and fish-like features. Cteno was promoted to the Elite Guard during the War of The Kings event. Aquatic Inhumans proved to be excellent combatants in the zero gravity warfare of outer space. Cteno served well in numerous battles against the Shi’ar. Following the war, when The Inhumans ruled from the Kree world of Kon-Tar, Cteno was reassigned to serve under Triton aboard a starship that patrolled The Fault. The ship came across a radioactive storm in the fault that caused the Kree crewmembers aboard the ship to mutate into grotesque monsters. For some reasons, Cteno and the other Inhumans on the ship were unaffected. Cteno again fought valiantly against these monsters, but sadly perished in the ensuing battle. An Inhuman with green skin and fish-like fins on the lower part of his face that roughly resembles a beard. Ciudar is a doctor and formerly served as the chief medical regent to the Royal Family. Cuidar tended to Crystal after she fell into a coma due to an overdose of the position that enables Inhumans to breath the polluted air outside of Attilan. Cuidar worked tirelessly to help Crystal and wake her from her coma, but nothing he did bared positive results, much to the dismay of Crystal’s then-husband, Quicksilver. Quicksilver was highly critical over Cuidar’s inability to wake Crystal from the coma, but Black Bolt maintained faith in the doctor. Quicksilver’s sister, Wanda (The Scarlet Witch) came to Attilan. Wanda used her magical mutant powers to reach Crystal’s spirit and bring her back to her body. Crystal awoke and, following a quick, examination, Cuidar stated that she would make a full recovery. Cuidar’s current whereabouts remains unknown. Following the fall of Attilan during the Infinity event and the establishment of New Attilan, Vinatos was identified as the new chief medical regent… a matter that suggests that Cuidar either perished in the fall of Attilan or was relocated to places unknown via the door of Elldrac. A notably tall Inhuman who had golden yellow skin, long hair of the same color, and a singular eye in the middle of her forehead that seemed to pulsate with unknown energy. The exact nature of her powers were left unrevealed, but she seemed to possess an enhanced awareness over spacial-temporal properties. Cyannius served on the Genetic Council during a time in which Black Bolt and The Royal family had been banished from Attilan, leaving the council as the supreme rulers of the Inhumans. Morgan le Fey’s witchcraft had recently raised the sunken continent of Atlantis. Cyannius’ fellow council member, Sapphrase, proposed investigating the resurfaced Atlantis and its potential connections to Attilan. Cyannius disagreed, stating that such a mission would risk exposure to the world of the humans; Cyannius’ objection was supported by the majority of the council. Shortly thereafter, a time-traveling Nathan Richards was exploring the citadel of Uatu The Watcher not far from Attilan’s location on the blue area of the moon. Richards’ trespass triggered a device that caused the citadel to transport into a limbo-like dimension; and the sudden absence of the citadel created a vacuum that began to drain the oxygen out of the blue area of the moon, threatening to destroy Attilan. Arcadius, the then Chancellor of the Genetic Council, decided that the citizens of Attilan could not be saved. He ordered that the Terrigen Crystals be gathered and that he and the council flee to Atlantis where they might recreate Inhuman society anew. Fearful for their lives, Cyannius and the other council members agreed with Arcadius’ plot. Cyannius and the council abandoned Attilan, but thankfully the city was saved by the Fantastic Four. Sue Storm came up with a plan to shrink all of Attilan with Pym particles, allowing her to carefully incase the miniaturized city in a transportable dome. On Atlantis, Cyannius and the other council members entered into a tenuous pact with Morgan le Fey. Meanwhile, the former citizens of Atlantis, who required water to breath were slowly dying in the subterranean caverns of the now surfaced continent. The combined efforts of the Royal Family, along with The Sub-Mariner, and The Fantastic Four ultimately defeated Morgan le Fey and Atlantis sank back down. Arcades betrayed his fellow council members and escaped on his own leaving the others to drown. Cyannius and the rest of the council perished as Atlantis returned to the sea floor. Afterwards, The Watcher’s citadel returned to the moon, re-oxygenating the blue area. The miniaturized dome city of Attilan was brought back and re-sized, its citizens saved from this terrifying affair. An Inhuman guardsman who possesses enhanced strength and a basically human-like physical appearance. Cryra and her brother, Mikon, chose to side with Maximus during one of the mad prince’s coups to take over his brother’s throne. Maximus assigned Cryra and Mikon with that task of hunting down any Inhuman defectors who attempted to leave Attilan. The two came across Gorgon who easily bested the two guardsmen. Even though he had defeated Cyra and her brother, Gorgon decided to surrender to them and have them bring him before Maximus. Gorgon feigned allegiance to Maximus and this ultimately led to his being assigned to venture into the world of men and locate the whereabouts of Madam Medusa (as seen in the Inhumans’ first appearances in the pages of Fantastic Four). The current whereabouts of both Cryra and her brother remains unknown.